WHAT IS THE OLD POST OFFICE ? The Old Post Office is actually just that, a beautiful and majestic three story building constructed of Indiana Limestone and completed in 1916. The building was originally home to the Western Nebraska Federal Court and Post Office for McCook, Nebraska. The Federal Court was moved to North Platte, NE in the 1950s while other State and Government agencies took up office space in the building. 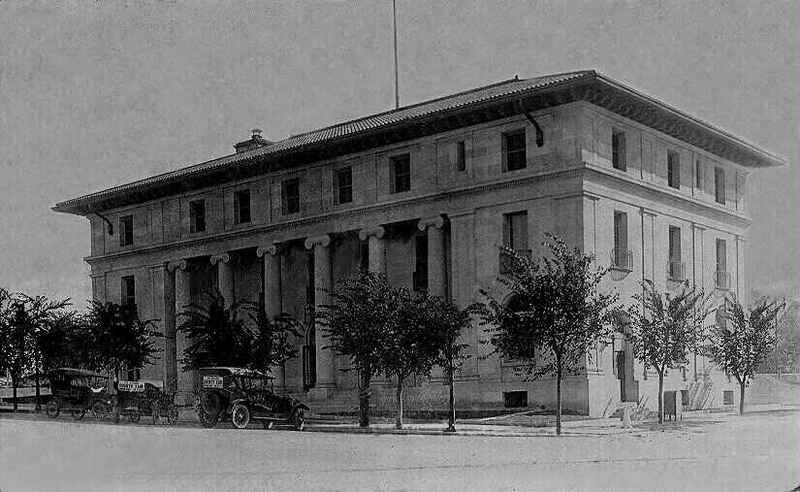 In the 1980s a new post office was built several blocks to the West of the original building. The building sat vacant for a number of years before being purchased by David and Sharon Huegel. It is now home to David and Sharon's Antique Shop and the location where Old Post Office Postcards was begun by their Son, Nathan. You can visit the antique shop in person at the top of the Main Street on Norris Avenue in the wonderful downtown shopping area of McCook, seasonally by chance or by appointment. The Old Post Office Postcard Co. is owned by Nathan and Crystal Huegel. Nathan's family has been in the Antique Business for over 40 years. Nathan has been dealing exclusively in postcards, photographs, and misc. paper ephemera since 1999 and has developed an extensive clientele. We have a reputation for being fair and honest in our dealings and love to build relationships with our clients. If we haven't done business with you yet, we hope to have the opportunity to help you acquire pieces for your collection. If you have postcards that you are wanting to sell please click here. We specialize in postcard Views from Nebraska and better Photo Postcards but have an extensive inventory of all types of postcards. There are over 2,600 scanned images of Nebraska postcards viewable online and listed alphabetically by town / topic in the card index links along the left edge of this page. You can also make an appointment to visit us in person or see us at an Antique and Postcard Shows we do annually or just browse our inventory "virtually". Feel free to send us a request of the town you are looking for and we will check our inventory of over 10,000 Nebraska views. Our inventory list here is no-where close to what we actually have and is changing all the time. If you are looking for a particular card, town or type of card just let us know via email and We will get back with you promptly. If we don't have it now, chances are we can find it for you. We have a real appreciation for better real photo postcards picturing Real Photo Americana, Social History or US State Views and have thousands of those types of cards in our inventory. Although the card indexes at left are mostly Nebraska views we do have many other States and Topics available for sale. Please feel free to contact us about your collecting interest. We have many other views listed on ebay We are hoping to get the site updated with additional State and real photo topical views as time allows. If you are ever traveling through the Great Plains you could always make an appointment to look at postcards. Nathan and his family have relocated to Lincoln, Nebraska area. Please contact us first before traveling a distance in case we are not available. If you would like to visit the antique shop at McCook you can contact Dave and Sharon from the contact page of the site. The McCook area has lots to offer with a nice retail district, parks, museums, hunting, fishing, and several lakes within a 30 mile radius. There is plenty of quality lodging and even a free campground. Find out more about McCook here. We have created a page with a little history about postcards and postcard collecting. Click here to view that page. You can also buy book related to postcards, photographs, stereoviews, etc... here.